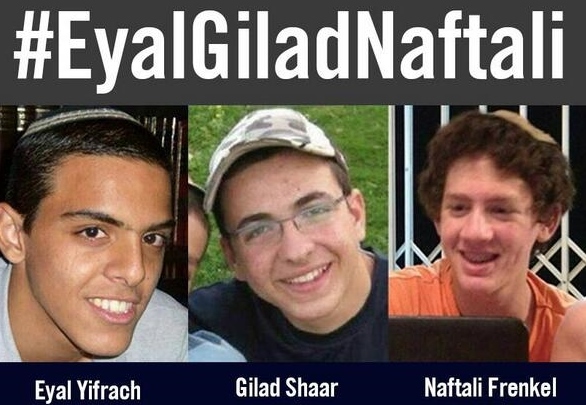 through the West Bank in June after the murders of three Israeli youths was justified. Prime Minister Benjamin Netanyahu intentionally seized upon that horrific crime in order to strike a blow at Hamas to some extent but mostly at the new Palestinian unity government. The story was based on the words of Salech al-Aruri, Hamas’ lead representative in Turkey, who had been applauding the despicable act since it occurred. A few other folks have been trying to correct the false story in the mainstream media, but it’s obviously an uphill battle. Few of Netanyahu’s defenders seem to have noticed that Israeli officials have remained thoroughly silent on this story. You’d think, would you not, that if it were what was being portrayed – that there is now “proof” that Hamas was behind the murders all along – Netanyahu would be crowing in the same hubris-filled manner that he did when one of the ceasefires was broken over a battle in a Gaza tunnel near Rafah. Yet the only sound is that of the proverbial crickets chirping. Yet the story continues to spread. A CNN report demonstrates how it is continuing to fill the empty minds of those who think Israel can do no wrong, at least when it comes to Gaza and Hamas. CNN’s headline of the story, at this writing, reads: “Hamas leader admits militants abducted slain Israeli teens.” I saw that and sighed; here we go again, with another bizarre misinterpretation of al-Aruri’s objectionable cheerleading for murder. Yes, that’s pretty much what happened. It’s what was commonly known back in June, and it’s been the story all along. But CNN’s headline, which is all that most people will read, completely misleads the reader. It gives the impression that al-Aruri has said something that is different from what has been the realistic understanding of this crime from the beginning. It is not speculative, nor is it a slant on matters. It is what Israeli intelligence was confident of from the outset, as soon as they knew who the kidnapper-murderers were. That, incidentally, was just days after the incident, just as Netanyahu was embarking on the crackdown that he justified by misleading the Israeli public. Another interesting point is that CNN was reporting, apparently, on an updated statement al-Aruri made from Qatar, although it was substantively the same thing he had said a few days before in Turkey. This has been clear, and in some outlets, even reported, since mid-June. And, as we see, even Israeli officials and CNN’s reporter are aware of it. The headline writer, sadly, seems to be another matter. And to most readers, the headline is all that matters. From the Israeli point of view, all Palestinians are bad and it doesn’t make much difference whether it was Hamas or Palestinian criminals who did the deed. But the burning alive of the Palestinian youth would, no doubt, be rationalized as the act of madmen who are in no way representative of the people of Israel.